Each table comes with several Share links (URLs). Send one of these links to your contacts and they will access your table (if you gave them the permission to do so). These links are available by clicking on Share above your table. 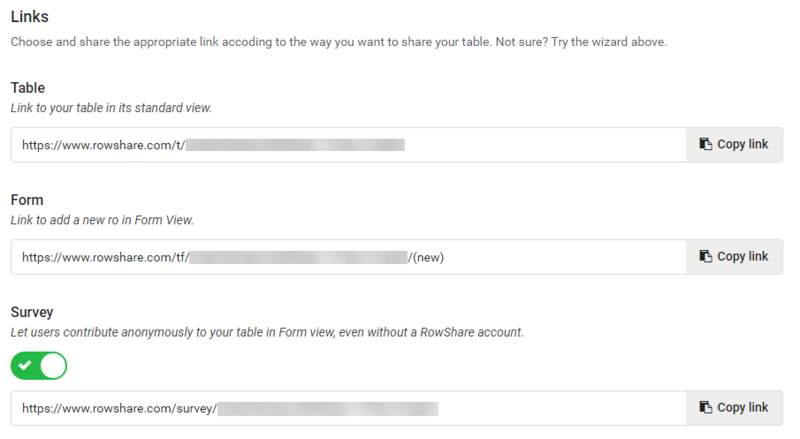 The first time you click on this button for a given table, a wizard helps you decide how you want to share your table and offers one sharing link based on your answers. Click on Sharing Settings at anytime to access all links described below. Table: this is the same link you use to access your table. Share it to let users see the table as you do. Note that they might not see all rows and columns, depending on the permissions you set for your table. Form: You have probably noted that each row of your table is also accessible as a form. Share this link to direct your users to a blank form that will automatically become a new row in your table. Survey: This link lets anyone fill anonymously a form that becomes a row in your table. You have no way to know who filled the row, and the users do not need a RowShare account to use this Survey mode. Survey Mode is deactivated by default. You need to enable it first before the link becomes active.